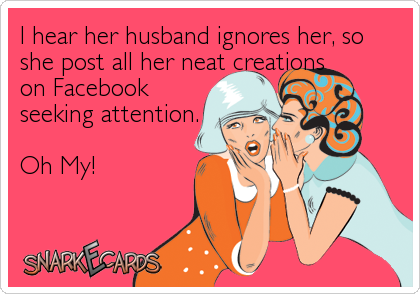 The Missouri Mom: Are you a Facebook attention whore? Are you a Facebook attention whore? to think about how many of my Facebook friends annoy me from time to time, then I started to rationalize why they annoy me. Why do their post constantly make me think yeah right? Staged? Are they really that bored? Do they really have time to do all this junk? Why are they so perfect and I am still sitting here in my pajamas praying to God my kids sleep late so I enjoy my coffee without noise? How do they keep their floors so clean, do they not have a 13 year old with a size 12 boot tracking in who knows what all day long? How is their house so much better organized than mine? Then I went a step deeper and started think why would they post all this stuff? Are they really out there sharing the information for the good of all? Do they have a purpose in this post? Are they bragging about how organized they are? Are they rubbing it in that they don't have a 13 year old tracking in who knows what? What is the story? I then started to think about how I feel when someone compliments me on Facebook. I remember I went through a time when someone would say how pretty I looked on Facebook and I would feel really good about it.....now I think awe it is so sweet they are so nice, if they only knew me in real life their jaw would hit the floor. With my thoughts, my memories, and my gut instinct I have come to my uneducated opinion that those women on Facebook that have cleaver perfectly arranged photos of their kids perfectly dressed doing adorable crafts are "attention starved, bored, desperate, lonely, Facebook attention whores". They get a literal high off of people clicking like on their staged photo. They get warm and fuzzy when they ask a made up, already knew the answer question and 30 of their closest social media stalkers answer them. They feel like they are needed when someone comments back to them asking for their input. I then begin to wonder if they are not trying to market themselves to the world? I am beginning to wonder if one day there will not be a diagnosis for this? Could there be a time that we see one of those special head doctors and diagnosis us with "social media anxiety"? Could one day social media crash and those people fall into a state of depression, because no one will see how their propped up 2 year old looked so cute washing dishes in her brand new rain coat, matching boots, and holding an umbrella?....Yes, I have seen photos that staged with comments like "I just walked in and caught her like that." Could we one day use the term "social media adultery" I mean typically you are suppose to get your "highs" and warm fuzzy feelings from those you love, not those that follow you and comment on all your statuses. If you have found yourself scratching your head wondering if this is you I am talking about, never worry I have a 12 tips for you. 1. Log off of your social media, delete your app off your mobile and think anti social for 48 hours. Then log back on and read your past post. 2. Stop dressing your kids up all cute and fancy to bake cookies. (note you may save money on clothes here also.) Take pictures of your kids dirty, half dressed, covered in messy not cute paint....share what is real. 3. Do not post about how fabulous the new dress you made for only $10 makes you look. Unless you planning to share exactly how you made that dress, where you bought the stuff at, and how many times you screwed up the project before you got it right. 4. Take a picture of yourself without make up and put it on Facebook....yes my profile pictures often show me without make up. 5. Be blunt, don't lie about never having a bad day. We are human, God allows us bad days, people know there are days you wanna just lay down and cry, so freaking admit you are human, not superwoman on steroids. 6. Share a picture of burnt supper, trashed bathroom, muddy floor, and failed remodeling project. I can tell you right now I fail more than I succeed, that is what adds humor to my life. 7. Take all pictures and talk down about how nice your car, truck, ATV, or boat is...we get that you may have worked hard for it, but that car does not make you who you are. 8. Admit that sometimes you become an emotional wreck, eat the whole box of Oreos, and don't bother to go to the gym. 9. Give your kids credit for their creations....I have one friend that always post the most creative things that her 5 year old does, and I truly believe the little guy does it, because it is stuff that he could really do. 10. Admit your spouse or partner really annoys you sometimes. Admit that your "marriage" is not perfect, that you sometimes get mad because they steal the remote, stink up the bathroom, or use all the hot water. Your love may be strong, but you are human. 11. Tell me how bad your kids really are. Tell me they fight all the time, they are mean to each other, they dirty up your house all the time, and clean out your refrigerator. 12. Confess that you get annoyed at all the other women "bragging" about things that you know are either staged or not real....if you can admit this you are cured! I realize I may lose 500+ friends tonight, but I really don't care. I don't need friends in my life that are constantly trying to make themselves look better or be better than me...not in real life or social media. I enjoy seeing real organic post, photos of my friends kids getting dirty, I love when someone post from mobile as you know they have most likely not edited, cropped, and accented the photo to show off their extreme talents. People I beg of you to be real, be honest, and be fair to all us other real moms that have paint, cookie dough, and pasta spilled on us all at once. Been there done that. It is the keeping up with the "Jones"! They are all Martha want-a-be life losers. So afraid to live life and leave the spill where it fell. They are the one's that end up on Dr. Phil. Just been following you recently, if you see me on FB Kim Curtis look at my friend numbers. I Have Friends On Mine Who Always Post And Their Hair, Make Up, House, Kids, EVERYTHING, IS Perfect. It Really Is Annoying. Everyone has a need for attention and to be liked and to fit in and what is so wrong with giving people what they need? It makes me feel good to make others feel good, even if all the effort I have to give is a little click of a like button. We never know what else is going on in their day and life and each person can make a difference and not even know it. I guess I don't have many FB friends who pretend to be unreal. Of course, I would rather having positive, uplifting posts than those people who post negative stuff all the time. Now that does get old. I don't think it is fair at all to assume such negativity about the subject(s) of this post. The post sounds a lot like sour grapes. Who are you to say a picture is or is not real life for that person? You said yourself that if people knew the reality at your home their jaw would drop - no one knows what happens behind closed doors, inside a family. You also said this was your personal blog with your personal thoughts so you would post what you want. Well how about giving the same respect to others? If they are proud of some craft why should any of us have a right to tell them it is wrong to post a picture? Marc, I said and I quote "now I think awe it is so sweet they are so nice, if they only knew me in real life their jaw would hit the floor."... my statement was about the difference in me when you see a picture of me and see me in real life. You have met me! In some of my pictures even I look and say is that me...even pictures I do not take of myself, others do. When you meet me in person, I look different....way different. That was my point to that. I also did not say those people are bad mothers, I basically said they need to let go and kick back....you can not pretend to be something your are not forever. proven fact. Thank you for your comment as always I appreciate my readers. Agree with Marc. You can't say, "This is my blog, I'll post what I want and you can't stop me," and then turn around and say, "You shouldn't be posting that on your page. I don't like it!" Are you a grown woman with children or are you a junior high school student? Because to me, you seem as though you're the latter.